Sir Douglas Haig described the object of the Cambrai operations as the gaining of a 'local success by a sudden attack at a point where the enemy did not expect it' and to some extent they succeeded. The proposed method of assault was new, with no preliminary artillery bombardment. Instead, tanks would be used to break through the German wire, with the infantry following under the cover of smoke barrages. The attack began early in the morning of 20 November 1917 and initial advances were remarkable. However, by 22 November, a halt was called for rest and reorganisation, allowing the Germans to reinforce. From 23 to 28 November, the fighting was concentrated almost entirely around Bourlon Wood and by 29 November, it was clear that the Germans were ready for a major counter attack. During the fierce fighting of the next five days, much of the ground gained in the initial days of the attack was lost. For the Allies, the results of the battle were ultimately disappointing but valuable lessons were learnt about new strategies and tactical approaches to fighting. The Germans had also discovered that their fixed lines of defence, no matter how well prepared, were vulnerable. 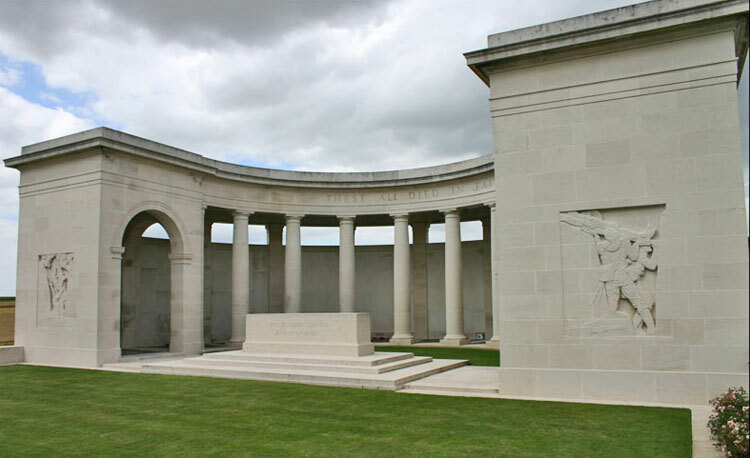 The Cambrai Memorial was designed by Harold Chalton Bradshaw with sculpture by Charles S. Jagger. It was unveiled by Lieut-General Sir Louis Vaughan on 4 August 1930. The memorial stands on a terrace at one end of LOUVERVAL MILITARY CEMETERY. The chateau at Louverval, was taken by the 56th Australian Infantry Battalion at dawn on 2 April 1917. The hamlet stayed in Allied hands until the 51st (Highland) Division was driven from it on 21 March 1918 during the great German advance, and it was retaken in the following September. Parts of Rows B and C of the cemetery were made between April and December 1917 and in 1927, graves were brought in from Louverval Chateau Cemetery, which had been begun by German troops in March 1918 and used by Commonwealth forces in September and October 1918.